Be inspired to cook yourself healthy and feel amazing in 2019 with Cook. Nourish. Glow. Following the phenomenal success of her bestselling first book, Eat. Nourish. 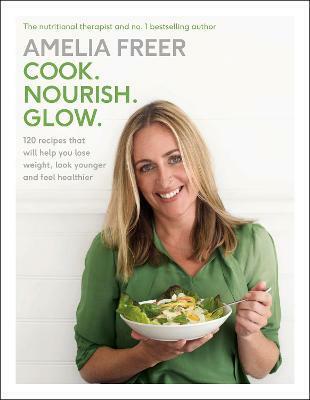 Glow, Amelia Freer returns with her much-awaited cookbook Cook. Nourish. Glow. With over 100 delicious and easy-to-prepare recipes, Amelia equips you with the skills and knowledge to improve your health while empowering you to cook with confidence. A professional nutritional therapist, she promotes a gluten, refined sugar and dairy-free lifestyle instead of endless fad diets. Cook. Nourish. Glow. covers cooking in the simplest terms, featuring step-by-step visuals designed for the novice chef; how to use and prepare staple pantry ingredients; eating clean on the go; a 'naughty' chapter - because living healthily is about consistency, not perfection - and a chapter full of dishes designed to combat gut-related issues. With Amelia's help, anyone can learn how to assemble nourishing food in minutes using fresh ingredients that will transform how you look and feel.